The adventurous smoothie maker that I am, I don’t know what took me so long to try blending fresh basil. Procrastination aside, let’s just say I’m delighted to have found another super smoothie ingredient to play with and benefit from. Incorporating herbs and spices into your smoothies is a great way to boost nutrition and improve the flavor. Basil is no exception. So, how can you improve your health with basil? Do you enjoy inflammation? Me neither. Basil is best known for its potent anti-inflammatory properties. 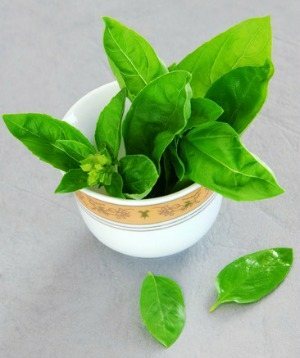 Anyone suffering from arthritis or inflammatory bowel conditions can find relief from basil. We all know how important antioxidants are, and basil is loaded with them. These free radical scavengers go to work all over the body helping to reduce signs of aging, alleviating common skin problems, protecting against some types of cancer, and ultimately offer protection at the cellular level. Basil also supports a healthy cardiovascular system and has strong anti-bacterial properties. The flavonoids and volatile oils in basil are responsible for more its health benefits. For the nerdy types like me, basil is extremely rich in vitamin K, and contains a fair amount of iron, calcium, fiber, manganese, and vitamin A along with trace amounts of other vitamins and minerals. For more information, see this article on the health benefits of basil. Basil is an herb you can grow at home or get fresh from the farmers market. I’m fortunate enough to be able to source fresh basil from my local organic CSA (Community Sponsored Agriculture). Basil is an easy addition to any diet – now try a little fresh basil in your smoothie and enjoy! Please leave a comment below if you try this strawberry banana basil smoothie. Happy Blending! I enjoyed this recipe! I used lemon basil and added the Greek yogurt. I’ll probably use just slightly less water, next time, and/or replace some water with ice. Loved it, though…thank you! Hi Belinda! Thanks for sharing your version of this recipe…lemon basil…yum. I’m going to update the recipe and recommend using a little ice if your fruit isn’t frozen, don’t want a runny smoothie. Cheers! Amazing! I put everything listed above minus the ice cubes and added some carrot juice and a blend of greens to go with the basil. Thanks for sharing! Hi Philamee, thanks for sharing your unique version of this smoothie – carrot juice and a blend of greens was a nice customization that sounds yummy. Cheers!